Our model this month, TJ, is ready for whatever Mother Nature can dish out! As a 13-year-old, TJ has a great sense of style, so his day-to-day school clothing definitely reflects that. His mom, Stefani, always shops Goodwill for staples like the gray Levi’s brand jeans he has on ($4.99) and long-sleeved t-shirts like the one here by Calida ($3.99). Easy and contemporary jeans paired with a t-shirt always look good for anything TJ might be doing. 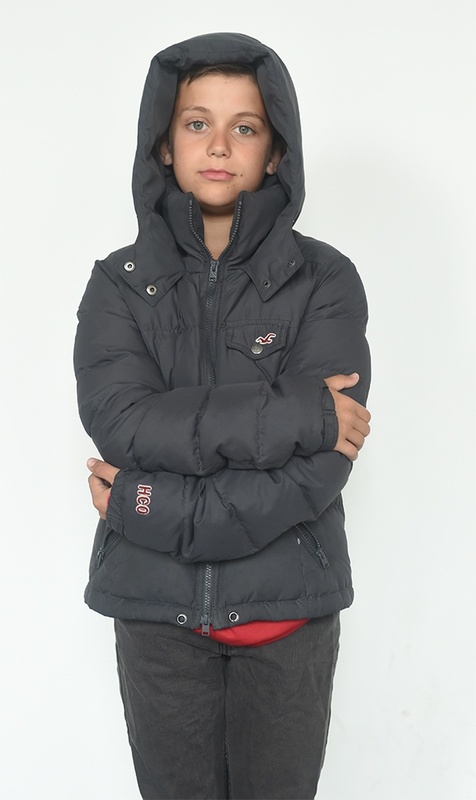 Another great item we found when doing this photo shoot was the great winter jacket in dark gray by HCO ($9.99). The black sneakers are his own. Keeping warm and looking good should always be a priority no matter your age, and with the selection and prices at Goodwill, you’re sure to come out a winner! Trish is wearing a fun workday look that has some flair! You just can’t go wrong with separates that when combined create great and different looks like this! Here we have an IZOD button-down blouse in black ($3.99), paired with a black floral Ralph Lauren skirt ($6.99). We decided to pattern mix here by staying within the color scheme, but giving it some zing with a houndstooth-patterned blazer, also by Ralph Lauren ($9.99). Each of these items could be matched up with anything else in your wardrobe, and they’d be great picks for anyone! We added a menswear-inspired touch with a tie that was $1.49, just to shake things up a little, but we kept her footwear classy and classic with leather pumps by Anne Klein ($4.99). Tying our office look together is a black leather handbag from Bath & Body Works ($4.99). Seeking out wardrobe pieces that are in the same color family will always yield great results when it comes to getting your personal look together like our fabulous model Trish!